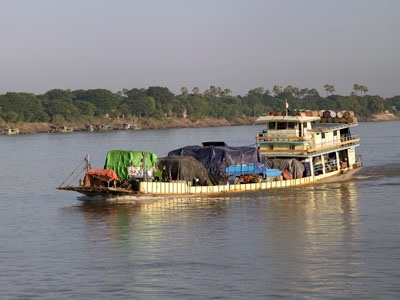 ABOARD KINDAT PANDAW-Myanmar (formerly Burma) may not be at the top of the list for the occasional or less adventurous traveler. But for those seeking a traditional society and culture not yet overwhelmed by modernization, it’s got to be on a pretty short list of destinations. 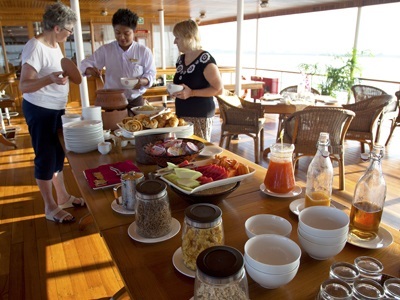 We think it noteworthy that all passengers aboard our Kindat Pandaw cruise were well-traveled. Most, if not all our fellow passengers have traveled to more places than we have, though we consider ourselves veteran travelers. We chalk that up to the destination. That we all ended up on this cruise may have involved a bit of serendipity—a more congenial, compatible group is hard to imagine—but we all ended up here because we share a spirit of exploration and discovery. Evidently no one has been disappointed. If Myanmar, with its history, culture, and most of all, its people, was the star of this show, then credits for production and direction must go to Pandaw. From our ideal Myanmar-built vessel, its “old flotilla” lineage evident in its style, to our warm, friendly and highly competent all-Myanmar crew, to the fresh local cuisine and representative local entertainment, this cruise was a “total emersion” experience. We always knew where we were and were delighted to be here. • The Ayeyarwady River. It’s a commercial artery and means of transport, a mirror reflecting the countryside, source of life-giving water and sometimes devastating floods, and the central thread of Myanmar’s history; it bore us through the heart of the country. • Our crew. From our Purser, Bobo, who directed everything on the vessel pertaining to our needs and comfort, to the food preparation and service staff, Jack the bartender, the officers and sailors who kept us safely on course and always assisted with boarding and departing the vessel, and especially Kyaw our shipboard guide and excursion leader who clearly explained and interpreted everything we saw, heard and tasted, our crew made us feel like part of their extended family. • The Myanmar people. The smiles, the waves, the warm, friendly and generous spirit of the people we encountered uplifted us. 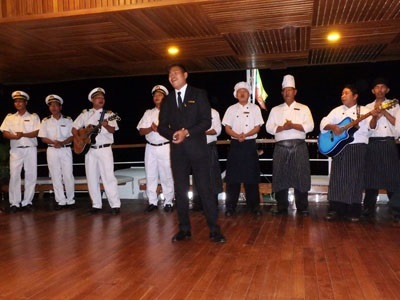 Kindat Pandaw‘s crew, led by Purser Bobo, entertains the passengers after dinner on the sun deck. Kipling’s “The Road to Mandalay” may have helped inspire us to make this journey, but it turns out the vision is not about Mandalay, but about the “road.” We think any traveler with a little explorer in his or her bones won’t want to miss traveling this road. And we think Pandaw River Adventures would be hard to beat as the way to do it.